J.J. Watt and José Altuve to be honored for their impact on Houston during and after Hurricane Harvey. For decades, Sports Illustrated has honored an athlete each year as ‘Sportsperson of the Year’. However, this year, the honor will be a bit different because it will have two recipients. 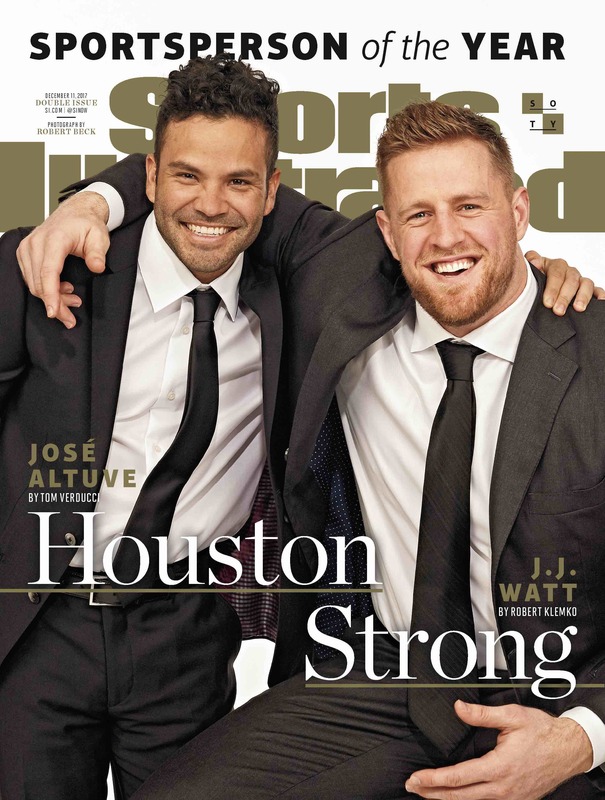 The Texans’ J.J. Watt and Astros’ José Altuve will receive the award due to their impact on and off the field in Houston. During record flooding in Houston due to Hurricane Harvey, both Altuve and Watt helped the city rebuild and recover. Stranded in Dallas, seemingly helpless while the hurricane devastated Houston, Watt decided to begin the rebuilding process a bit early. He kickstarted a fund with a $100,000 donation, in hopes others would match his contribution and the fund could reach $200k. Celebrities, sports figures and citizens around the globe began to contribute and the fund ended with upwards of $37 million in donations. Needless to say, he reached his goal. Meanwhile, Altuve and the Houston Astros gave the city a glimpse of hope. When all seemed dark in Houston, the Astros gave the city something to rally around, be excited for and take their minds off the storm. Wearing ‘Houston Strong’ patches on their jerseys for the remainder of the season following the hurricane, the Astros went on to win their first World Series in franchise history. The duo will receive the award on Tuesday night at the 2017 SI Sportsperson of the Year Award Show. The award show will take place at the Barclays Center in New York. The show will be broadcasted live nationally for the first time on Dec. 8 at 8 p.m. ET on NBCSN, as well as Univision Deportes Network at the same time the following day.